</p><p style="margin-top: 0; margin-bottom: 7px;"><img src="http://images.wisbar.org/Images/DigestEmails/Good_Colin_100w.jpg" alt="" width="110" height="133" align="right"/>If you practice employment law, you may have run into Colin B. Good. In addition to his practice, Colin has presented at several State Bar of Wisconsin PINNACLE<sup>®</sup> seminars and institutes. He took a few moments to answer our questions about speaking at CLE programs and share his tips for delivering an engaging presentation. 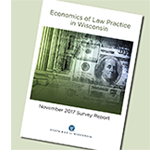 <p style="margin-top: 10px; margin-bottom: 7px;">Download the most current version of the form(s) you need every time with <a href="https://marketplace.wisbar.org/OnlineForms/Pages/Online-Forms.aspx">Fillable Forms Banks from State Bar of Wisconsin PINNACLE</a>. <p style="margin-top: 0; margin-bottom: 7px;">Informed business decisions are an integral part of your firm’s success. Does the thought of making those decisions fill you with dread? It doesn’t have to!